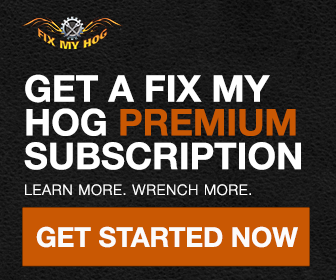 One of our new features is the Fix My Hog Video Subscription. Now, for as low as $4.17/month (when signing up annually), you can get access to our library of hundreds of how-to and instructional premium Harley videos. We also continue to offer our same DVD and tools/parts collection as before. We have plenty of Free content available to all our guests without logging in to an account. As part of our commitment to Hoggers everywhere, we’re always looking to improve the experience we provide for you. We’d love to hear what you think about the new website and any other thoughts you might have. Please feel free to drop us a line. Thanks and wrench safe! I do not plan to wrench on my Hog; should I watch the videos? Are your videos applicable to my Harley-Davidson? I have the Factory Service Manual, why should I get the Fix My Hog videos? Do your videos cover the Twin Cam 96, 103 and 110 in / 6 Speed? Do you have a 3D version of the Twin Cam engine? Do you show the FLT fairing removal on the Street Glides? Will doing my own maintenance on my Harley void my warranty? How do you fit 2.5hrs of High Res video and audio on one DVD? I did not get the My Service Sheet login, who do I contact? What’s the “script” and how do I get the “script”? What fluids are best for my bike? Where do baby Harleys come from? I do not plan to wrench on my Hog; should I buy the Videos? A: It’s a good idea to know how your Harley works. If you plan on having someone else do the service on your Harley, the Fix My Hog® videos will show you what should be getting done. If you are new to riding, the videos give you a great overview of the bike and the jargon that’s used in the industry. What video is applicable to my Harley-Davidson? A: The Maintenance and the Performance videos are applicable to all models from late 1984, when HD switched to the Evo® Motor, through Present day Twin Cam 88, 96, 103, 110. More info on models covered and site navigation can be seen on this post. The Sportster Maintenance and Performance videos are applicable for all model Sportsters (XL) from 1986 through Present day. I have the Factory Service Manual, so why do I need the Fix My Hog videos? A: The manuals are great and a must. However, they are written for HD techs and assume you went to MMI or work at a dealer. Our videos not only go through “how to” but “why” and even more important basic shop procedures. Fix My Hog brings the manuals to life. A: We ship UPS Ground which can take 3-5 days to deliver in the US. Do your videos cover the Twin Cam 96, 103, 110 / 6 Speed? 2) When HD went to Formula+, the interval changed to 20K on the transmission fluid (after the 1K service). 2006 and 2007 models both had the transmission fluid service listed at 20K. 3) Primary fluid is at 1K, 10K and every 10K. More info on models covered and site navigation can be seen on this post. A: No, not on the Touring Edition DVDs. But we have it on Fix My Hog for free. Will doing my own maintenance void my warranty? A: No… Please call your dealer or speak with a Harley-Davidson customer service representative at (414) 343-4056 and ask them the question and document the answer. From what we understand, as long as you document the service intervals, it will not void your warranty. A: DVD9 – Some discs on the Touring, Softail/Dyna and Sportster Edition DVDs and all Bolt-On DVDs are DVD9s. DVD-9 holds around 7.95 computer GB. Also called Single Sided Dual Layered the layer break is at Steering Head adjustment chapters on the Sporty and Touring DVDs. If you have an older DVD player, you might see a hiccup in this chapter at the layer break. It should play through. If not try another DVD player or the DVD player on your computer. To provide the highest quality video and audio experience with the least number of DVDs we use DVD9s for our large content titles. A: Still like the feel of paper? You can register your Fix My Hog DVDs and we will email you the script, Bob’s own words, so you can print it out for your shop. That’s a Free book valued at $29.95! *Not available for the Part 2 DVDs and the Softail & Dyna Bolt-on Editions at this time. A: Loctite is OEM specified and they are a great company, with great products. Print out the motorcycle application guide they made and keep your nuts from falling off. A: Menomonee, WI; York, PA and Kansas City, MO. A: At Fix My Hog your complete satisfaction is important to us. Any unopened or damaged DVDs purchased from our online store may be returned for a refund (minus shipping charges) within 14 days of the date of purchase when accompanied by a copy of your order form. All items must be returned in original condition and include all original tags and product packaging. (excluding any shipping cartons and packaging materials used therein), and may be shipped to the address below. Please note that Fix My Hog reserves the right to determine, in our sole discretion, the condition of returned merchandise. Ship all items prepaid, via USPS. Remember to get a tracking number from the shipper. C.O.D returns cannot be accepted. All My Service Sheet sales are final, no refunds or cancellations. For online video subscriptions, Fix My Hog will prorate annual subscriptions upon request for a refund or cancellation of a current subscription. No refunds will be provided on a subscription that is no longer active or monthly subscriptions. Please contact customer service on any questions regarding active subscriptions and requests for a refund. Our video site contains both free and premium content. You do not need to be a paid members to view the free content on the website. You do need to be a paid Premium Member if you want to view the premium video content. If you are a Premium Member, login in to the video website to view the premium video content. On the log in page, enter your username and password. Go into the login page and select forgot my password. Enter your username and select Send New Password. If you are logged in to your account, you can change your password by clicking on the Account Details. You can also log into the site using the email address you used when you signed up for your subscription. How do I pay for my monthly / annual Premium Membership? Monthly Membership: Your monthly membership lasts for a 30-day period starting on the day you register and pay for your FMH Premium Membership. Annual Membership: Your annual membership lasts for a one-year period starting on the day you register and pay for your FMH Premium Membership. Your membership will automatically renew using the credit card we have on file, at the then prevailing member dues rate. Monthly memberships will be charged approximately 5 days prior to the end of your monthly term. Annual memberships will be charged approximately 10 days prior to the end of your current term and you will be notified prior to the renewal. We do this to ensure uninterrupted access to your membership benefits and renewals are applied to the end of the current term. Your credit card statement will list your membership as PP* Fix My Hog Purchase, 1-855-231-0653. You can reach customer service by email at fmhsubscription@program-director.net, or at 1-855-231-0653 should you choose to remove your membership from automatic renewal. You may cancel at any time. Cancellation of your monthly membership will be effective the next billing cycle. Cancellation in the first 30 days of your annual membership will result in a full refund. Cancellation after 30-days will result in a prorated refund. Our annual Premium Membership allows you to view all of the premium video content for one year from the start of your membership. Monthly memberships allow you to view all of the premium video content for 30 days. All memberships automatically renew based on your selected term (monthly or annual). You may cancel your membership at any time by contacting customer service. To obtain a refund, please contact us at 855-231-0653 or by email at fmhsubscription@program-director.net. Are there any system requirements to view the Harley video content? Our video content is best when viewed on a computer manufactured in the past couple of years with a good broadband Internet connection (not dial-up). We also highly recommend using the latest version of Firefox, Safari or Chrome as your Internet browser, though recent versions of Internet Explorer will work as well. The recommended screen resolution is 1024 x 768 or larger. On the video play back page simply click the full screen button (four arrows pointing outwards). To exit press the ESC key located in the top left of most keyboards. How to I find a video? What is a keyword? You can find videos in two ways. Click the Video tab in the navigation bar. This will allow you to view video content by topic. You can also use the search bar at the top of the page. Yes, you can access the video content from any mobile device connected to the Internet.